Tires are some of the worst landfill offenders due to their durable composition and sheer volume, which has resulted in many landfills limiting the amount of tires they accept. Fortunately, tire recycling is becoming more prevalent to help pick up the slack, with old tire recycling into asphalt, shoes, basketball courts, and even art. If you’ve got used tires to get rid of, we can help you do it as responsibly as possible. Plus, we can handle any kind of tire recycling you need. 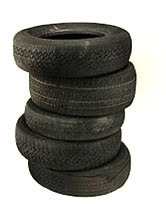 We pick up bike tires, truck tires, and construction equipment tires. As long as we can lift them, we’ll take them, and you only pay according to how much space your old tires take up in our truck. Give us a call at 1.844.744.5865 or book your junk removal appointment online. We will call you 15-30 minutes before your scheduled 2 hour arrival window. When we arrive, just point to the junk you want removed and we will provide you with an upfront, all-inclusive price. Once you say the word, we’ll haul everything away from wherever the items are located. We recycle and donate your junk whenever possible.